The Vikings are nowadays remembered as merciless pirates, fearless Scandinavian warriors and conquerors. Their real identity is not far from the current conception, which is, unfortunately, just a bit exaggerated. The name “Viking” comes from the Old Norse “vik” which means “bay” which formed “vikingr”, which means “pirate”. The great story of the Vikings began somewhere near 800 A.D. and lasted up until the 11th century. 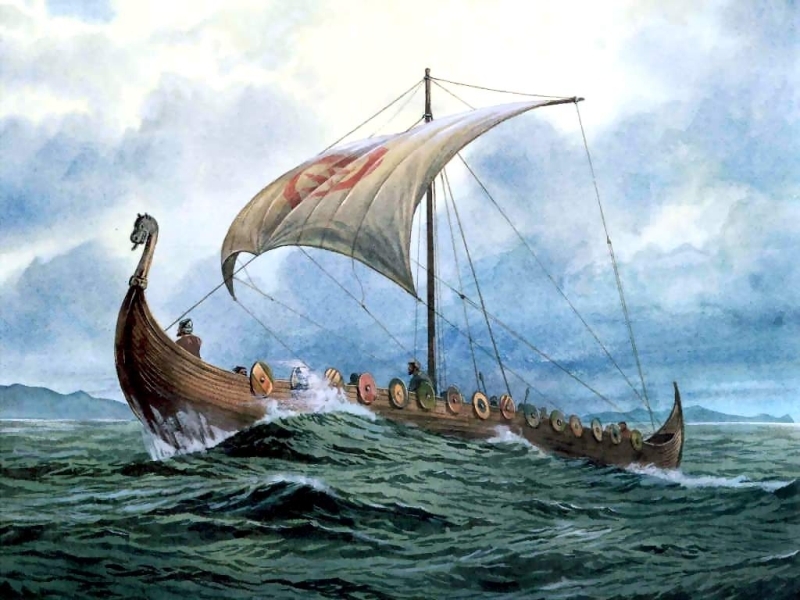 They were commonly known as Norsemen (Danish, Norwegian, Swedish, Finnish), and they started raiding nearby coastal sites with their famous long ships. Their favorite target were the monasteries on the British Isles, which were almost always left undefended. The Christians never suspected that someone would really attack and pillage a sacred place, such as a monastery. The Vikings took advantage of this oversight, and they started raiding them periodically. The first recorded attack took place in 793 A.D. when the Norsemen raided Lindisfarne monastery on their quest for riches. Even if they didn’t destroy the monastery, it was a huge blow for the Christian world as it was something unseen before. Only two years after this, they raided Skye and Iona, two island monasteries which were also defenseless. Their choice of weapons depended on the social status of the warrior carrying them. The wealthy ones would usually carry a full armor and a sword, while the commoners usually fought with shields and spears. The Viking weapons and combat were considered a bit unusual for their times, for example they were also famous for their use of axes in fights. 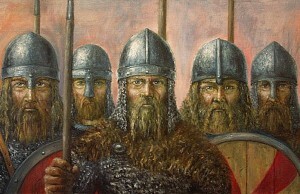 The first sign of the Scandinavian warriors expansion was the first European raid, which took place in 799 A.D. on the monastery of Noirmoutier. They soon got used to these raiding tactics, so they kept on doing it for several decades. They saw an opportunity arising as a result of the internal conflicts that were raging in Europe, and advanced even more on the territory of Frankia. They took the British Isles as their main target and they soon started settling on British territory, controlling the Northern Isles of Scotland and part of the mainland. Vikings also had a reputation as big traders, founding the first Irish trading towns (like Dublin). The Norsemen then launched their full force on England, succeeding in the vast majority of their battles. By 871, the kingdom of Wessex was the only one still resisting their attacks, even defeating a Danish army. 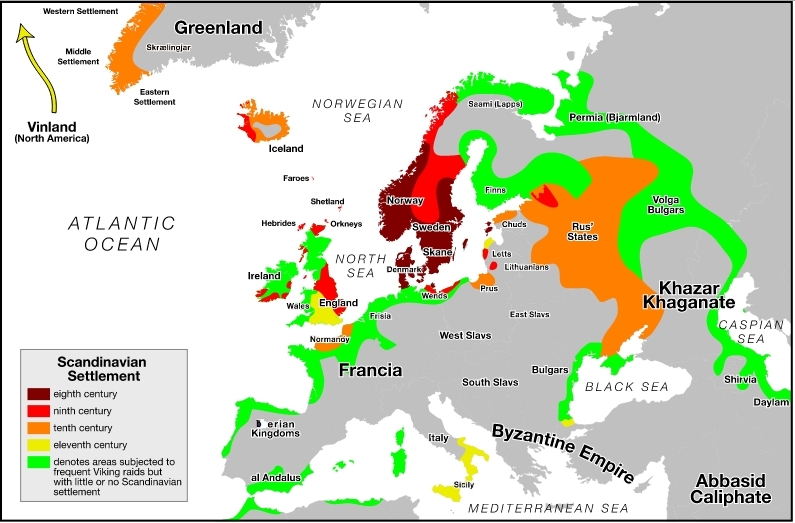 Some of the Vikings became farmers and traders, settling on the British conquered territory. The English armies slowly started to fight back, reclaiming their lands. By 952, Erik Bloodaxe (the last Scandinavian king) was killed, and the English finally succeeded in reuniting as a one whole territory. While they were fighting in the West, Norse armies continued to raid and sack European lands to the point where Rollo, a great Viking chief, was given Normandy in exchange for keeping other Norsemen from raiding further inside Frankia. That territory is nowadays named “Normandie” which translates in “land of the Northmen”. Always in a quest for conquest and riches, the Vikings went as far as Iceland and Greenland, supposedly under the lead of the famous Leif Eriksson. The second Scandinavian warriors Age came with Harald Bluetooth leading a now Christian Denmark. The raids became more organized and more powerful, leading to a full conquest of the British kingdom in 1013. After the reign of his son Knut, the re-conquest of British kingdom succeeded again in the hands of William, Duke of Normandy, who was crowned king in 1066. This was actually the end of the Viking Age, as William also succeeded in repelling any further challengers. The Viking legacy still lives today through archeological remains, and vast literature that remained mainly in Iceland. These allowed us to learn more about their ways and traditions. One very interesting tradition is that of the burial ceremony. The Norsemen used to lay the deceased on a boat, with jewelry and possessions matching his former status. The sacrifice of slaves was another common thing to do as a funeral custom for an important chief.